Alloys containing titanium are known for their high strength, lightweight, and exceptional corrosion resistance. Despite being as strong as steel, titanium is about 40 percent lighter in weight, which, along with its resistance to cavitation and erosion, makes it an essential structural metal for aerospace engineers. Titanium is also formidable in its resistance to corrosion by both water and chemical media. It does this by forming a thin layer of titanium dioxide (TiO2) on its surface that is extremely difficult for these materials to penetrate. Having a low modulus of elasticity means that titanium is not also very flexible, but returns to its original shape after bending, resulting in its importance to shape memory alloys. Titanium is non-magnetic and biocompatible (non-toxic, non-allergenic), which has led to its increasing use in the medical field. The use of titanium metal, in any form, only really developed after World War II. In fact, titanium was not isolated as a metal until the American chemist Matthew Hunter produced it by reducing titanium tetrachloride (TiCl4) with sodium in 1910; A method now known as the Hunter process. Commercial production, however, did not come until after William Justin Kroll showed that titanium could also be reduced from chloride using magnesium in the 1930s. The Kroll process remains the most important commercial production method to this day. After a cost-effective production method was developed, titanium's first major use was in military aircraft. Both Soviet and American military aircraft and submarines designed in the 1950s and 1960s began making use of titanium alloys. By the early 1960s, titanium alloys started to be used by commercial aircraft manufacturers as well. The medical field, particularly dental implants and prosthetics, awoke to titanium's usefulness after Swedish doctor Per-Ingvar Branemark's studies dating back to the 1950s showed that titanium triggers no negative immune response in humans, allowing the metal to integrate into our bodies in a process he termed osseointegration. 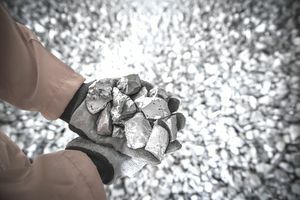 Although titanium is the fourth most common metal elements in the earth's crust (behind aluminum, iron, and magnesium), production of titanium metal is extremely sensitive to contamination, particularly by oxygen, which accounts for its relatively recent development and high cost. The main ores used in the primary production of titanium are ilmenite, which accounts for about 90% of production, and rutile, which accounts for the remaining 10 percent. About 6.3 million tons of titanium mineral concentrate was produced in 2010, although only a small fraction (about 5 percent) of titanium concentrate produced each year ultimately ends-up in titanium metal. Instead, most are used in the production of titanium dioxide (TiO2), a whitening pigment used in paints, foods, medicines, and cosmetics. In the first step of the Kroll process, titanium ore is crushed and heated with coking coal in a chlorine atmosphere to produce titanium tetrachloride (TiCl4). The chloride is then captured and sent through a condenser, which produces a titanium chloride liquid that is more 99 percent pure. The titanium tetrachloride is then sent directly into vessels containing molten magnesium. In order to avoid oxygen contamination, this is made inert through the addition of argon gas. During the consequent distillation process, which can take a number of days, the vessel is heated to 1832°F (1000°C). The magnesium reacts with the titanium chloride, stripping the chloride and producing elemental titanium and magnesium chloride. The fibrous titanium that is produced as a result is referred to as titanium sponge. To produce titanium alloys and high purity titanium ingots, titanium sponge can be melted with various alloying elements using an electron beam, plasma arc or vacuum-arc melting. Over the past few decades, aircraft manufacturers have turned to titanium as a key structural component. From its first uses in the early 1960s, the average titanium content in commercial aircraft has continued to increase. Vulcan, Tom. 2010. Titanium: The Metal of the Gods. Hardassetinvestor.com.